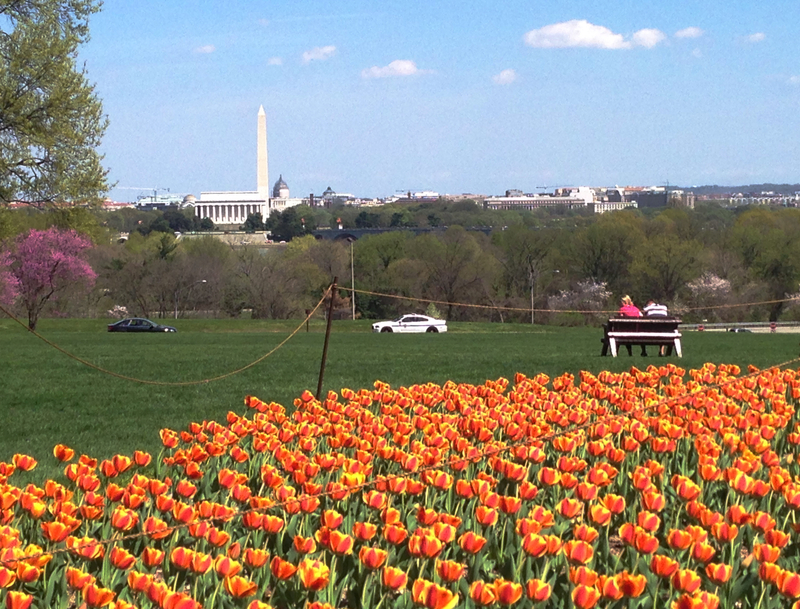 After a relatively harsh winter, spring is finally here in Washington, DC. 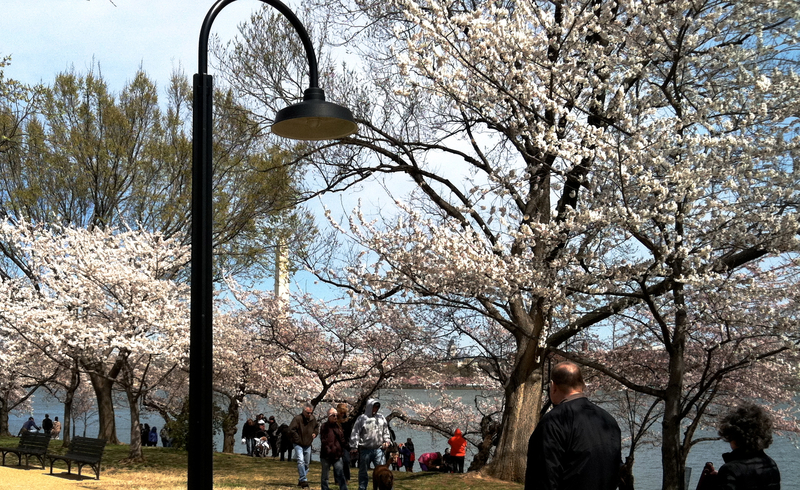 This means the pursuit of the DC’s cherry blossoms! The cherry blossoms are an elusive spectacle. Cool weather prolongs them, warm weather accelerates them. Wind, rain, and a spring snowstorm are all bad for them. They are spectacular when in bloom but it doesn’t last long and the timing is difficult to predict in advance. All over town there are signs that winter is over. People plan vacations around seeing them. My father for years would ask me when he should visit from New Hampshire to see them at their peak. We would settle on a weekend and he would arrive only to find they had come and gone, or would not bloom for another week. The “Sakura”, or flowering cherry trees were a gift from Japan in 1912 and have become as much a symbol of DC as the monuments. The trees were a gift in 1912 from Japan. First Lady Taft was instrumental in their being spread around the Potomac riverfront and among the monuments. The Japanese government donated 2,000 trees. 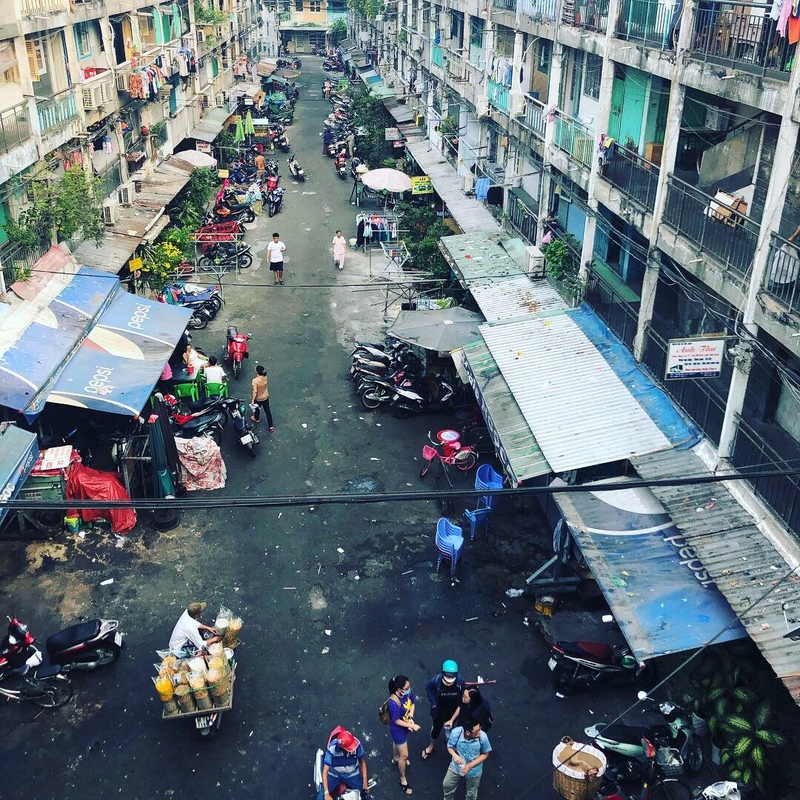 For those of us who live here, seeing them at their peak means joining crowds of tourists, walking from a distant parking space, or somehow finding time in the off-peak hours to check them out. This year we opted for the “Cherry Blossom Cruise” aboard the Boomerang Yacht, a 1-hour trip down the Potomac from Georgetown to the 14th St Bridge and back. 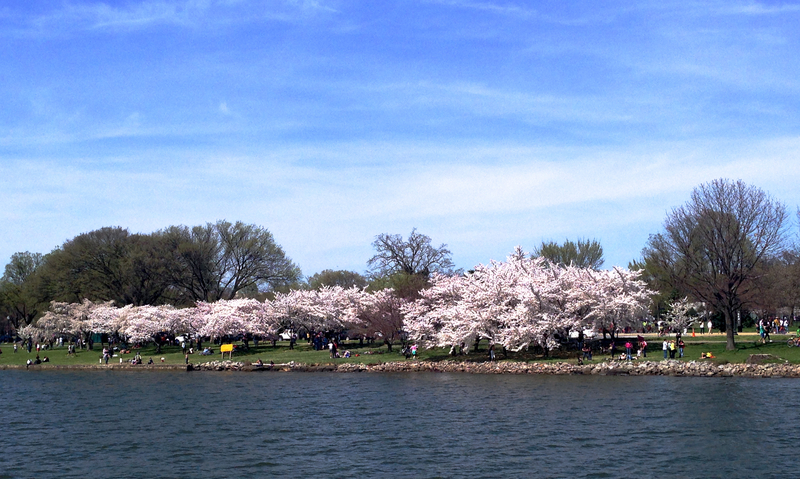 This year my wife and I decided to go full-on tourist and take one of the many cherry blossom cruises on the Potomac. There’s a lot of them, and the one we chose was great. The Boomerang Yacht departs from Georgetown Harbor, goes down to just short of the 14th St. Bridge, and back. 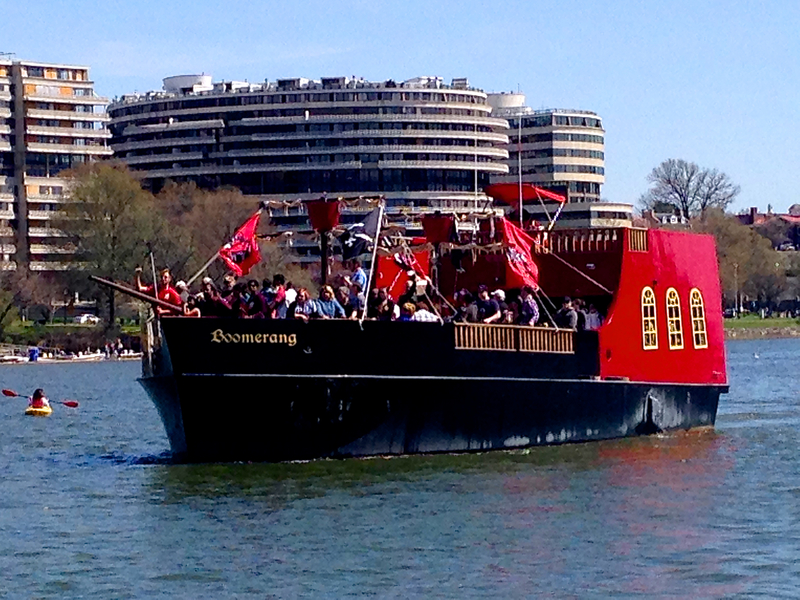 The irony of spotting a pirate ship in front of the Watergate Complex! 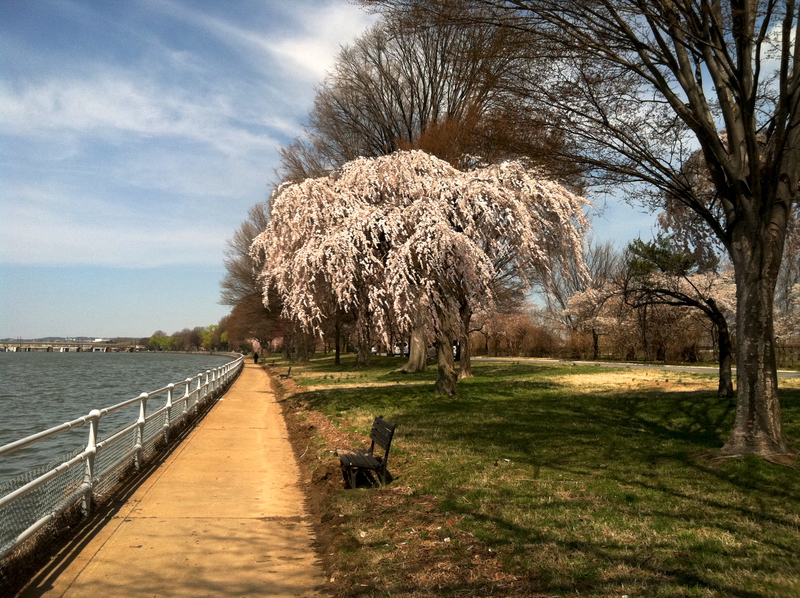 To pursue the cherry blossom is to be rewarded by the puffy quilted look of hundreds of blooming trees lining the Potomac River, the Tidal Basin, and around all the major monuments. 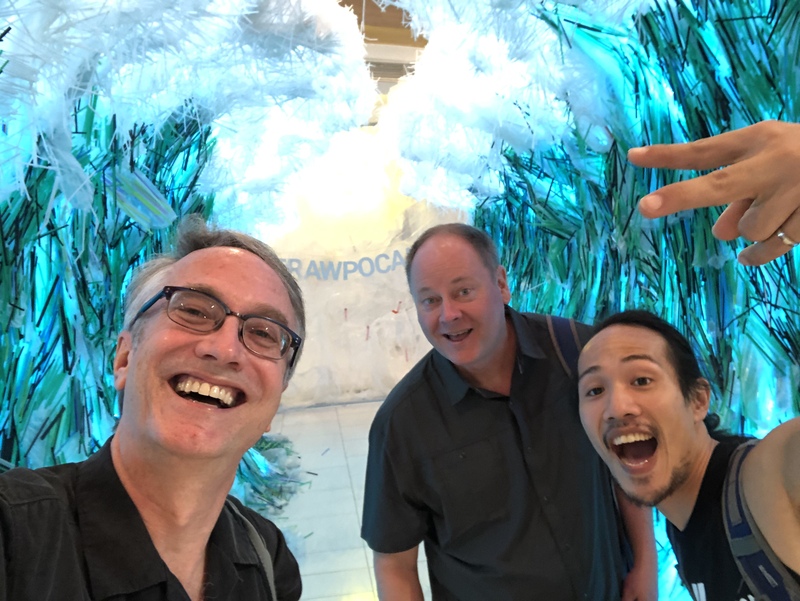 The roads are choked with traffic and people from all over the world are out there with selfie-sticks, zoom lenses, and endearing family poses. On the day of our cruise there was activity everywhere! Kayaks filled the river, bicycles, strollers, and joggers filled the bike path, and slow-moving traffic filled the streets. On this day, the river cruise was the place to be! To catch the cherry blossoms at peak is to experience a vivid quilted dreamscape. They blanket the river and monuments for 1-2 weeks and then they are gone. 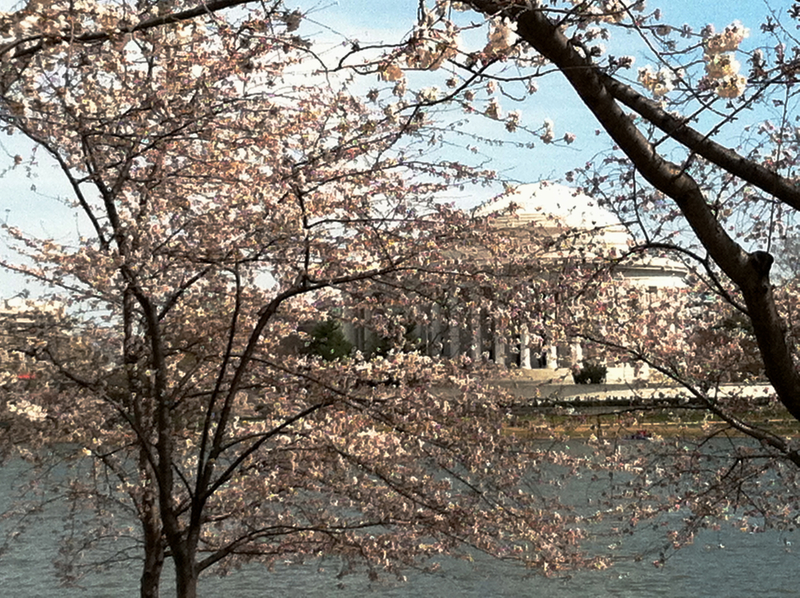 The Jefferson Memorial viewed through the cherry blossoms from across the Tidal Basin. 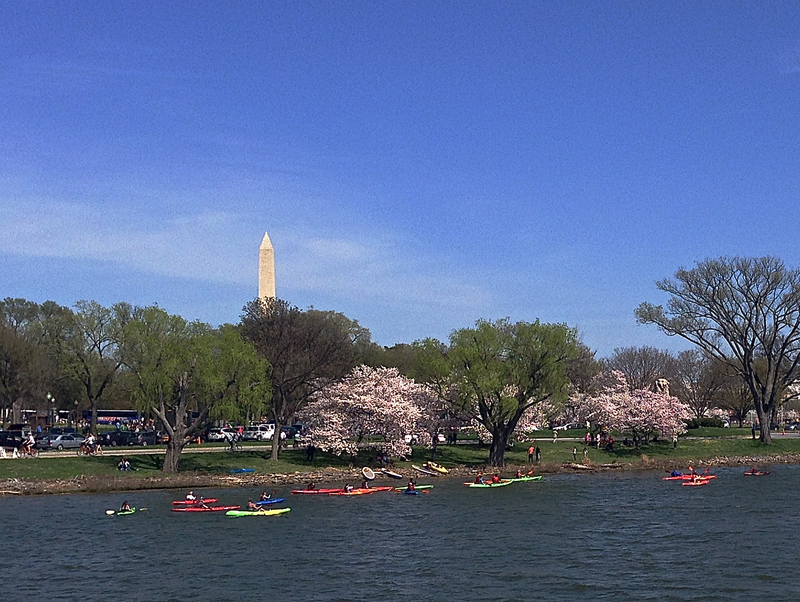 The Washington Monument viewed from the Boomerang Cherry Blossom Cruise. DC is a great city in many ways but I personally do not get out on the river much. This day I wondered why that was because there’s no shortage of ways to do it. You can rent kayaks, rowing sculls, sailboats, paddle boards, canoes, and there are lots of party and dinner cruises. Seeing the city from the water made me think I would have to start taking advantage of some of these. 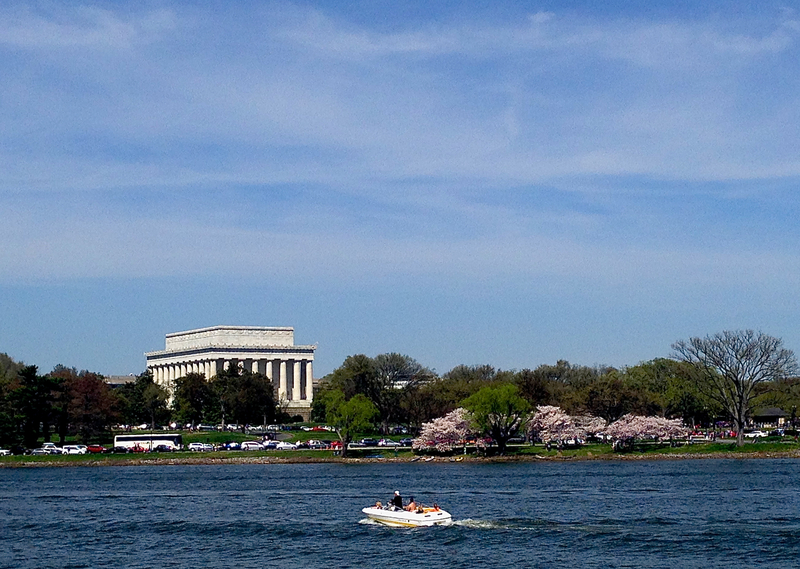 The Lincoln Memorial marks the beginning of the most impressive stretch of cherry blossoms on the riverfront. The Arlington, VA neighborhood of Rosslyn sitting behind the Memorial Bridge. The opposite shore is Arlington, VA, where I live. 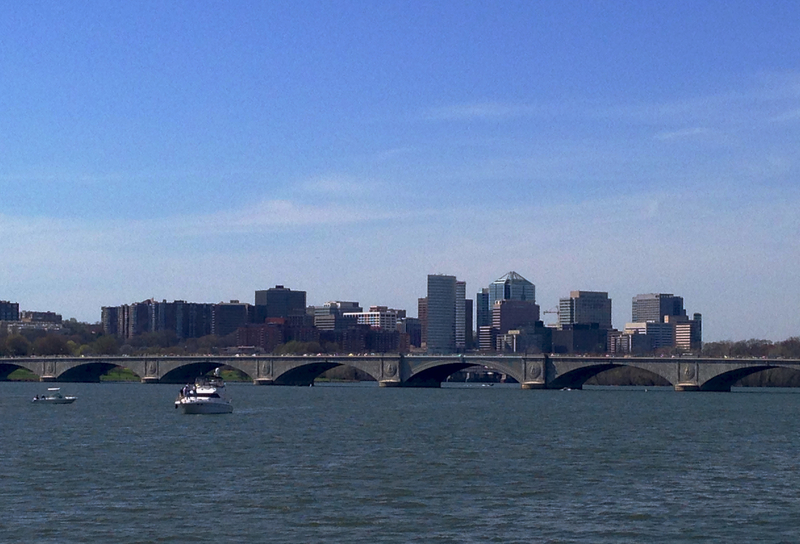 Heading upstream we got a great shot of Arlington’s Rosslyn neighborhood tucked behind the Memorial Bridge.